This week’s prompt: What I would do If I couldn’t be a writer. Who is the evil person who thought up this prompt??? This is the stuff of nightmares! Are they a horror writer? Was it Stephen King? OR maybe it was a descendent of H.P. Lovecraft. If I couldn ‘t be a writer, I would probably have pursued teaching as my second career choice. I worked as a civil servant for the department of defense, my degree is in cartography. Back in those days, I was firmly convinced that science was where the money was at, and only pure genius writers could earn a living actually writing. I digress. . . but, All Star seriously sums it up. Getting on the career track, following the ruts, doing the things you think you are supposed to do and then somewhere down the road you run out of gas, and look around and realize this isn’t where you wanted to be. I was late in the game to allow myself to pursue my dreams of writing. I don’t know, I guess with my upbringing and the push for success, I didn’t allow myself to chase dreams. I was already labeled a daydreamer, and I resented that my mom said it with an air of disdain. Yes, I have mother issues. I’m dealing with it! So, after Ellie version 2.0, stay at home mom left me with time to read, time to do crafts, sew, crochet, . . .did I mention read???? I read voraciously. I read to my kids. My eldest daughter’s favorite book was Moo Bah, LALALA. I can recite it from memory. My youngest daughter’s favorite was Goodnight Moon. I can also tell that one from memory. When we ran out of books to read before it was time to go back to the library, or we had exhausted our home library I began making up stories to tell them and they liked mine better! It gave me the boost I needed to pursue my writing aspirations. When both of my kids were in school, I started substitute teaching at their school. There were certain parts of the substituting that I really enjoyed. So if I couldn’t write, I probably would have pursued teaching science at the junior high level. I’m sure it would have paid better, and set my husband’s mind at ease. He tries to be supportive, but the unknown factor of writing is whether or not people will buy your book. Money isn’t everything, but it sure helps out to pay the bills and buy groceries! Hence I keep the dayjob as mortgage loan officer until my books fly off the shelf! Never say never! It’s the beginning of a new year, a time to dream and let your hope rise! What would you do if you couldn’t pursue your dreams? Would you vet your creative interests in another direction or shelve them? So here we are with Ellie version 3.0 – author, editor, mortage loan officer, blogger – doing what I love, trying to manage my time effectively to get the things done! In the past, I would have been quite upset. In the past, I would have been ten times bent out of shape because my plans were derailed. In the past, . . . well you get the idea. I make plans, they get trashed. You’d think I would get used to it by now, but no. I can’t afford to get upset over this anymore, it’s not worth it. I can choose to go with the flow, adapt, overcome, and change directions on the fly. Well, sort of. OK, so maybe I don’t adapt on the fly. There are a few kinks and jagged edges before I accept the inevitable. Alright, in some cases I am downright pouty that my plans were trashed. Like my plans for January – trashed. I haven’t been in the “Oh well” frame of mind. I’ve been in the ‘toddler kicking and screaming mentally’ stage. Hey, I know my truth and at least I’m honest about it! Real mature, I know. I need to adapt a more French “C’est le Vie” approach, or the “que sera sera” or a more Bohemian -“Oh well.” attitude. Changing your habits and behavior is a difficult thing and sometimes those learned responses that are programmed into the rabbit tracks of our brains, you know the automatic responses, still show up even when you think you’ve kicked it. It’s the same type of thing that triggers PTSD, seriously it’s the same brain parts. I know y’all don’t want to talk about the amygdala and the reticular formation so we will move on. For example, I had laid out a plan for my blog with themed days again. Mojo Monday with my motivational posts to stir myself and others up! Tasty Tuesday where I will share new tasty Cancer friendly meals. I was undecided on Wednesdays and Thursdays, Fridays would be the MFRW posts, and Sunday to get back to the WeWriWa snippets. All of this has left me with little left to give out, feeling exhausted and drained emotionally and physically. Not that y’all aren’t important to me, because I’ve told y’all before, I get super excited when I get a new follower, or someone leaves a comment. It really is a high point in my day! But there comes a time when there are other life matters that take priority over what I want, over a self-imposed deadline that only really matters to me. Seeing a loved one in the hospital in pain, or the nerve-wracking waiting for them to be out of surgery. This is when you have to accept the moment, be in the moment and realize that the most important parts of our lives are the friends and family we love and that love us. You are only truly blessed when you love and are loved. I think this is one of the really sad part of our current society, people will spend hours on social media, yet isolate themselves from the people who care about them. Do yourself a favor. Put down your phone, get off your tablet and engage with someone. Call your mom, ask her what’s for dinner and tell her how much you appreciate her. Call your sister you haven’t seen or talked to in weeks or months. Go visit your kids and grandkids! Life is too short. We need to embrace the moments of joy that life offers. Make part of this year’s goals be spending real time with friends and families and living life. I have a lot more I’d like to say, but I need to go to the hospital to visit my sister. The “tyranny of the should haves” is really working overtime on me and I don’t want to add to it. Go! Live! Laugh! Enjoy life. Have dinner with someone you love! Visit a friend or at least call. That’s what our phones are really for. Guess what? 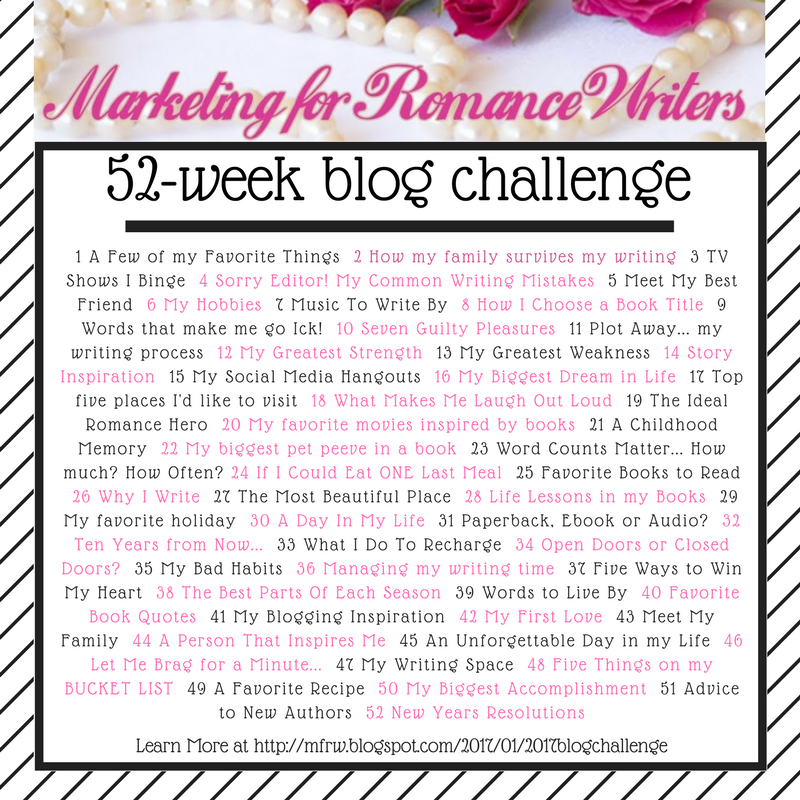 MFRW is doing a 52 week blog hop for 2018!! YAY! TO kick things off for the new year, this is my first week post for that blog hop. Sometimes I take off running with these prompts only to find that I went in a totally different direction than everyone else participating in the bloghop. So, let’s first address the obvious qualifier – the favorite thing I’ve written that’s published. Roxy Sings the Blues – ultimately this is a tale of overcoming insurmountable obstacles, a tale of triumph. It also has elements of romance, intrigue, and a few bits of humor. The reason this is my favorite over my other published book, Red Wine & Roses, or 30 DAys of Sass is that I feel I worked very hard on fully developing the characters in this one. I spent a lot of time trying to capture the emotional punch and I feel I nailed it! I think my writing has improved greatly from my first book, and I hope that I continue to improve as time goes by. Now the less obvious, more obscure point that my brain seems to gravitate towards first – my favorite bits that I have written and as yet is unpublished. *Clears throat* You’ll have to excuse me for a bit while I gush. I am excited about my Realm Wars series. It started with Faere Guardian, the first draft was a Christian fiction that lacked . . . everything. I had to change so many things to fit into the Christian bookseller’s association guidelines for publication, that much of my story was lost. For example – the list of words NOT allowed is lengthy. I couldn’t use Angel for my character’s name and I didn’t want to change her name, she is paid to screw things up for Kyle and throw incredulity on his name and mess things up between Kyle and Lindsey. Then I wrote Faere Warrior: Passion’s Price. OK, I may have ventured off into the erotica little too deeply for this one to be mainstream, but the essential tale of the McIntyre brothers has to be told. I will probably give this a heavy edit and make it more mainstream friendly. Then of course, there is the sister – Brigit. Faere Mage is filled with antics of the up and coming Druid mage, and the Faerie Realm underlying meddling in human affairs. We can’t forget the original brothers Robert, Ian, and Alistair who is the first generation McIntyres. How did they become keepers of the realm? Who are they protecting? DO they work for the FAE? Do the FAE work for them? Come on, I know you’re interested! LOL But, with the myriad of questions thrown at me, I was able to answer them all. This was a problem though, because she then told me that I need to tell the backstory that ties them all together, and unites the greater story that is going on. SIGH I had spent a week cutting out the backstory and paring it down to a reasonable length. This is why it is yet unpublished. However, I plan to change that this year. I will have the first book written and revised some time this year. I have to check my calendar in order to get a definite deadline. (Don’t worry, it’s on my todo list!) Books 2 through 4 are already written, they may need a few tweaks but for the most part are already complete. Also, The Blood Key – the novella I have been working on will be released in an anthology- I HOPE! Fingers crossed that I make the cut! If not, I will still release it as a short available for my readers. I’ve shared a few snippets in the past from this series, and I feel this is some of my best writing. When you feel like you’ve done your best, then it’s easy to pick that as your favorite! Realm Wars writing has been in the zone. Red Wine & Roses had bits in the zone, but not the entire thing. Same for Roxy, more of it was in the zone, but not all of it. Realm Wars is the type of stuff I love to read – paranormal fantasy, urban fantasy, epic fantasy type stuff. I’m probably not going to be writing the epic space odyssey, well maybe not. I’m pretty proud of the world building I’ve done in this series as well. I keep saying series and as of yet, not one book is released. BUT, when I get the covers nailed down, and the first book completed, books 2 through 4 will not be far behind. Books 5 and 6 may take me a while, but I already have my outlines. I promise not to pull a George R. R. Martin! Unless of course someone buys the film rights and pays me handsomely to produce an epic saga of Realm Wars, paying me royalties and megabucks up front. Then I’ll finish the last two books in the series from an island oasis in the Caribbean! Never say never! It’s the beginning of the new year, a time to dream and let your hope rise!